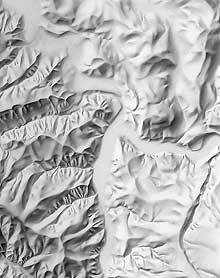 Analytical relief shading is the computer-based process of generating a shaded relief from a digital elevation model (DEM). Perspective view and analytical relief shading of the Matterhorn (based on DEM “DHM25” © swisstopo). 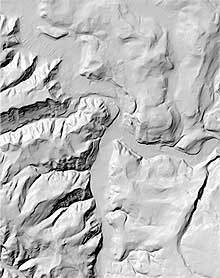 Despite the impressive amounts of detail that characterize analytical shaded relief, cartographers generally prefer the superior legibility and aesthetic quality of well executed manual shaded relief, especially for demanding cartographic applications. Nevertheless, enhancements with Photoshop can bring desirable manual qualities to an analytical shaded relief base. Comparison of manual (left) and analytical shading (right).